The history of railroads in Afghanistan is brief. There just are not that many railroads. However, there are big plans afoot to increase the number of railroads by major players with the hope of capitalizing on the vast untapped mineral resources thought to be in Afghanistan. Early History of Railroads in Afghanistan. Emir Abdur Rahman Khan, who reigned as king from 1880 to 1901, banned the building of railways in Afghanistan. His reasoning was that the lack of railways would decrease the ability of powerful countries to invade and sustain forces that would occupy Afghanistan. At the time Russia and England were engaged in "The Great Game". Each wanted a neutral or friendly Afghanistan as a buffer against the ambitions of the other nation. So while the ban against railroads protected Afghansitan from being assimilated by a great power; it also stunted its economic growth and development. 4. Kabul - Darulaman Palace Railway. In the 1920s King Amanullah conceived plans to build a rail network in Afghanistan. Many were opposed to the plans and when he was overthrown in 1929 his dream of an Afghan railway network went away. He did, however, construct a 5-mile stretch of railway from Kabul to his Darulamn palace that supported steam locomotives. 11. and 12. Afghan Government Oversight of Railways. The railways were initially under the Ministry of Mines. There are plans to establish a railways department within the Ministry of Public Works to facilitate strategic planning and oversight on the development of railways within Afghanistan. It is or will soon be called the "Directorate of Railway". 5. Big Plans for Railways in Afghanistan. The government of Afghanistan and other international players have grand aspirations for the future development of Afghanistan's railways. The rich mineral deposits combined with Afghanistan's strategric geographic location holds great promise. In times past Afghanistan was a transit point for trade across the Asian continent and was referred to "The Great Silk Road". It is hoped to bring those times back again. Many of these railways may soon tie into the Northern Distribution Network (NDN) and the New Silk Road. See a map of some of the past proposed railways for Afghanistan here provided by the "Railways of Afghanistan" website by Andrew Grantham. Towraghondi Railway Spur. This short railine is located on the Turkmenistan border and connects Towraghondi, Afghanistan with Serhetabat, Turkmenistan. It 2007 sections of this railway was rehabilitated. The railway was built by the Soviets in the early 1980s to support the Soviet occupation of Afghanistan. 1. Hairatan-Mazar-e-Sharif Railway. Currently there is a 47-mile (75-kilometer) railway that runs from the border town of Hairatan in Balkh province, Afghanistan to Mazar-e Sharif in northern Afghanistan. Mazar-e Sharif is Afghanistans' second biggest commercial center. The rail terminal is at Naibabad which lies just east of the Mazar-i-Sharif airport. This railway was just recently completed in late 2011. The Uzbek built railroad 2. was funded in part by loans from the Asian Development Bank with approximately $165 million through its Central Asia Regional Economic Cooperation Program (CAREC). The United States and Japan are the two largest shareholders of the Asian Development Bank. The government of Afghanistan provided $5 million. This railine connects Afghanistan through Uzbekistan to the vast regional markets in Europe and Asia. 3. The rolling stock to be used will be Uzbekistan vehicles acquired from the Soviet Union during the separation of Uzbekistan from the Soviet Union in 1991. Mineral Resources of Afghanistan. One promising economic development is the rich mineral deposits in Afghanistan consisting of iron, lithium, gold, and copper. The Afghan government is in the process of awarding contracts to foreign firms for the extraction of these minerals. Part of the contracting process is the building of rail lines that will help move the heavy minerals to refineries and out of the country. Of course, these rail lines will improve the economic situation of Afghanistan because it will improve trade and commerce in many other areas as well. 7. and 12. Proposed Kabul - Uzbekistan Railroad. One railroad currently being planned would link Kabul with a huge copper mine in Aynak, Afghanistan and with the Hairatan railroad in Northern Afghanistan. This 575-mile railway will be built by the China Metallurgical Group Corporation (MCC) with the China Railway Group. 10. Proposed Central-West Afghan Railroad. In an effort to accomodate the movement of iron deposits found in central Afghanistan (Tajigak) an Indian consortium may be funding a 560-mile railroad that could lead to the Iranian border. Proposed Turkmenistan-Mazar-i-Sharif Railroad. There are plans to build a railway from Mazar-i-Sharif to northwestern Faryab province along the Turkmenistan border. The project will likely cost $350 million and run 220 kilometers. Proposed Iran to Herat Railroad. There are plans for a railway to run from the Iranian border to the city of Herat in western Afghanistan. However the progress has been slow and there is no current end date for completion due to security concerns. 8. Proposed Five Nations Railway Corridor. This possible project envisions the establishment of a railway corridor running through Afghanistan that would connect to Iran, Tajikistan, Kyrgyzstan, and China. A study was underway in early 2018 to determine the viability of the corridor by the Afghanstan National Railway Authority (ANRA). 13. Railways of Afghanistan. By Andrew Grantham (UK). Provides a history of Afghanistans railways and recent news and updates as well. Rail Transport in Afghanistan. By WikipediA. A detailed description of the history of railways in Afghanistan. Maps of Afghan Rail Projects. By Andrew Grantham (UK). A series of maps on the Railways of Afghanistan website. Stefanie Nijssen, The Rise of the Afghan Rails, Regional Railway Linkages and Economic Growth in Afghanistan, Civil-Military Fusion Centre, November 18, 2010. Accessed here on March 10, 2012. Asian Development Bank, ADB TA 7259 - Afg Railway Development Study, Phase I Final Report, Volume 4, Land Acquistion and Resettlement Plan, September 2009. Adobe Acrobat PDF accessed here on CIMICweb.org website March 2012. March 26, 2015. "Afghanistan's Big Project: A Train to Europe". Newsweek. President Ghani envisions a time when Afghanistan is a transit country sending its goods to Europe, the Middle East, South Asia, and China by rail. February 3, 2015. "Turkmenistan-Afghanistan-Tajikistan Railway Advances Further". Silk Road Reporters. The railway could link Central Asian states to the Persian Gulf. May 2, 2014. "U.S. works to get Afghans on track with rail network". Fayetteville Observer. July 31, 2013. "Afghan Province Upset at Being Left Out of Touted Rail Network". Radio Free Europe. Konduz province officials are unhappy with route change. May 20, 2013. "Railroads to Afghanistan". Business New Europe. Central Asian States ready for railroad expansion to Afghanistan. March 21, 2013. "Turkmen, Tajik, Afghan Presidents Sign Railroad Agreement". Radio Free Europe. Memoradum calls for 400-kilometer railroad. February 19, 2013. "US, Chinese Plans for Rail Links with Central Asia Triggering 'Railroad War' and Reducing Russia's Influence". The Jamestown Foundation. October 4, 2012. 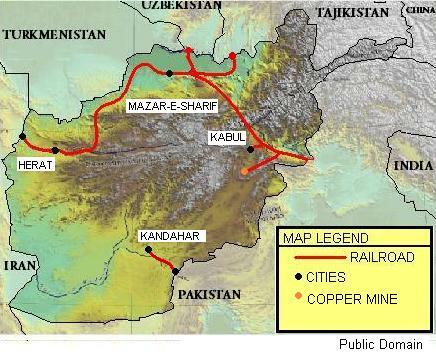 "Railroads a must for Afghanistan mining". Wadsam - Afghan Business News Portal. March 29, 2012. "Dreams of a Mining Future on Hold in Afghanistan". NPR. March 27, 2012. "Tajikistan plans railway link with Iran". The Telegraph. March 15, 2012. "Afghanistan finally embraces the railroad". WBEZ 91.5. Radio. March 10, 2012. "Afghanistan joins railroad era - 100 years late". Google Hosted News. February 3, 2012. "Afghan railway starts commercial traffic". Railway Gazette. December 21, 2011. "Afghan railway: First train runs on new line in north". BBC News. December 21, 2011. "Afghan train may speed up U.S. supply transport". Marine Corps Times. November 4, 2011. "Afghan railway ambitions awarded funding". Railway Gazette. October 20, 2011. "Six firms in the run for railroad feasibility study". Pajhwok Afghan News on CIMICweb.org. October 21, 2010. "A railroad through Afghanistan". Vital Concerns for the World Blog. September 27, 2010. "After nearly a century, a modern Afghan railroad is under construction". CNN World News. September 23, 2010. "Agreement signed for north-south corridor". Railway Gazette. July 14, 2010. "Afghanistan in China's Emerging Eurasian Transport Corridor". By Richard Weitz, Hudson Institute. June 28, 2010. "Afghan rail strategy takes shape". Railway Gazette. June 13, 2010. "Afghanistan to complete first railway by end of year". The Telegraph. May 25, 2010. "U.S. Ambassador Karl Eikenberry Remarks at Hairatan Rail Line Ceremony". Embassy of United States in Kabul. May 25, 2010. "ADB President Inaurgurates Rail Line Linking Afghanistan to Central Asia". Asian Development Bank News Release. January 27, 2010. "Construction of Afghan railway launched". Railway Gazette. August 29, 2008. "Europe to China Through Afghanistan". Railway Gazette. January 29, 2008. "Opening up Afghan trade route to Iran". Railway Gazette. January 21, 2002. "Afghan rail plan among proposals for donors". CNN.com. January 1, 2002. "Aid train reaches Afghanistan". Railway Gazette. Railway from Hayratan to Mazar-e-sharif, Awaz News video. Posted on Railways of Afghanistan website and accessed here March 2012. Khyber Pass Railway. Filmed in 1997 this video shows the Khyber Pass railway in Pakistan. Posted on Railways of Afghanistan website and accessed here March 2012. Afghanistan's First New Railroad on Track, Radio Free Europe, Octoer 14, 2010. Accessed here on March 10, 2012. 1. See Afghan rebuild underway, Railway Gazette, July 12, 2007. Accessed here March 2012. 2. For more about the Uzbekistan national rail company see Uzbekistan builds Afghan railway, Central Asia Regional Economic Cooperation. Accessed here March 2012. 3. The Hairatan and Mazar-e Sharif railway opened in December 2011. Read more in Hairatan-Mazar-e-Shariff railway opens, highlights country-to-country cooperation, Central Asia Regional Economic Cooperation, December 2011. Accessed here March 2012. 4. For more info on the history of railways in Afghanistan and the Great Game see Railways and the Great Game on the Railways of Afghanistan website by Andrew Grantham accessed here March 2012. 5. The "Directorate of Railway" will be part of the Ministry of Public Works. See an organization chart on the Afghan Ministry of Public Works website accessed here March 2012. 6. See Afghanistan: A railway history by Paul E. Waters available on Amazon.com for more on the history of Afghanistan's railways. 7. See Preliminary Mineral Resource Assessment of Selected Mineral Deposit Types in Afghanistan by the U.S. Geological Survey, 2007. 8. For a detailed history on past and current attempts to build an Iran to Herat railway see the Iran to Herat web page on the Railways of Afghanistan website accessed here March 2012. 9. For additional info on the M-e-S Hairatan rail project see Hairatan-Uzbekistan Rail Project, Afghanistan, Railway-Technology.com accessed here March 2012. 10. See Agreement signed for north-south corridor, Railway Gazette International, September 23, 2010 accessed here March 2010 for more info on the north-south railway between Kabul and Uzbekistan. 11. See WikipediA for a description of the Kabul-Darulaman Tramway accessed here March 2012 and Kabul to Darulaman railway on Railways of Afghanistan website accessed here March 2012. 12. For more on the importance of railways for transporting iron, copper, and gold see "Afghanistan's Minerals Await Vital Railroads", Bloomberg Businessweek, March 6, 2014. Accessed here. 13. See "Five Nations Railway Corridor to Power Regional Economies", Tolo News, February 15, 2018.